……what’s in, what’s out, what’s leaving! 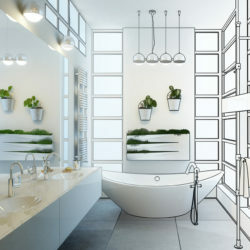 Interior design trends are always on every design lover’s mind. What design trends are coming in? What interior decorating trends are fading? You want to know BEFORE you write that check for new furniture for your living room! Or before signing the contractor to redesign your master bath. 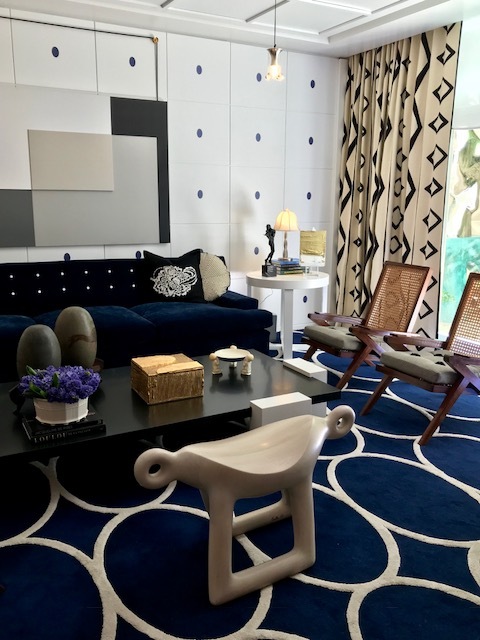 Our clients look to IDH to steer them into classic choices with fresh visions, a deep understanding of the trends, and yes, making it happen so it speaks to their specific design cravings and lifestyles. #1 Wallpaper is Back, Big, Loud, & Strong…and don’t forget the ceiling! Give the paint roller a rest. This year’s house brimmed with wallpapered walls, papered ceilings abounded, and some wallpapers were trimmed with Passmenterie. 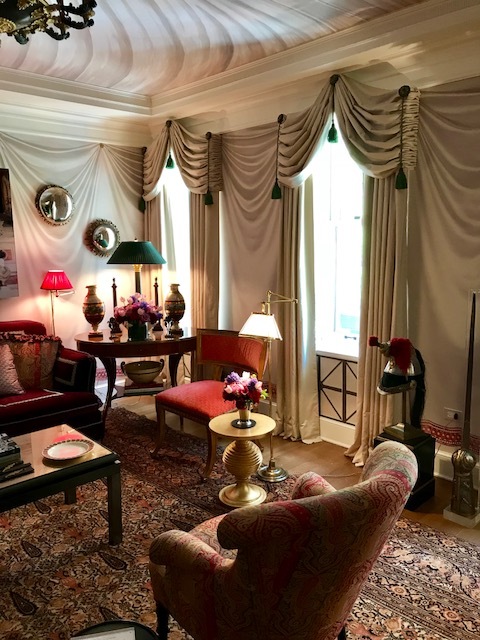 There were fabric upholstered walls, fabric draped ceilings, and trompe l’oeiled walls. 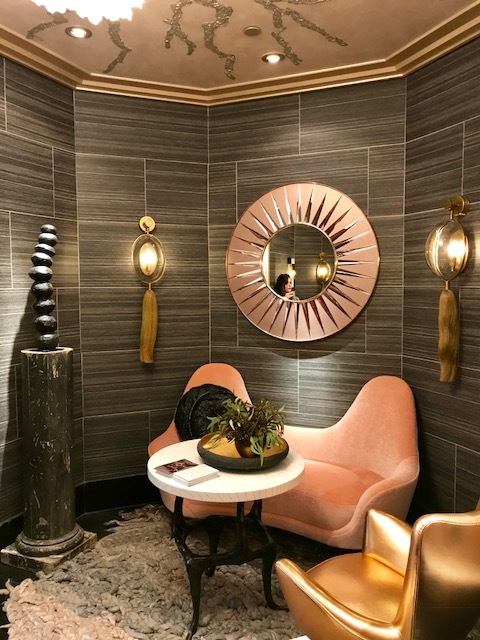 Paper ranged from some grass clothes, yes, but the bigger story was pattern and texture – from florals, to murals, to faux embossed leathers, and metallic cork. By Stefan Steil: Charcoal wallpaper, hand painted ceiling…and yes…peach settee and golden rod leather chair. 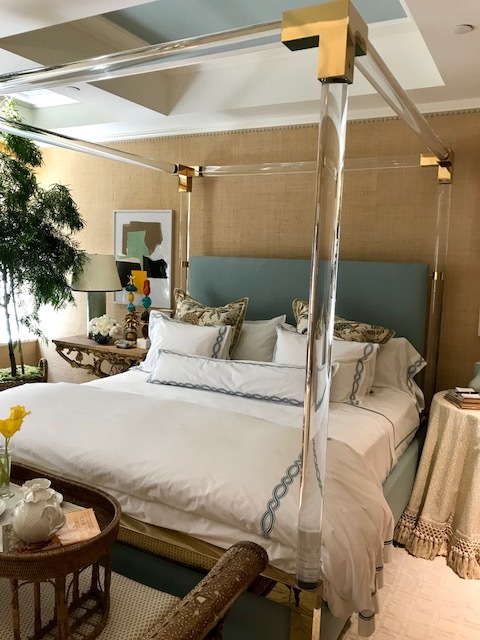 By Casa Branca: Grass Cloth Walls, painted coffered ceiling, Lucite® canopy bed next to an antique side table and (out of view) inlaid antique armoire. By Brian Del Toro: Chinese screen sitting in front of grass cloth covered wall. By Drake Anderson: wallpapered ceiling…and hello to our Katie taking her own perfect shot!!! 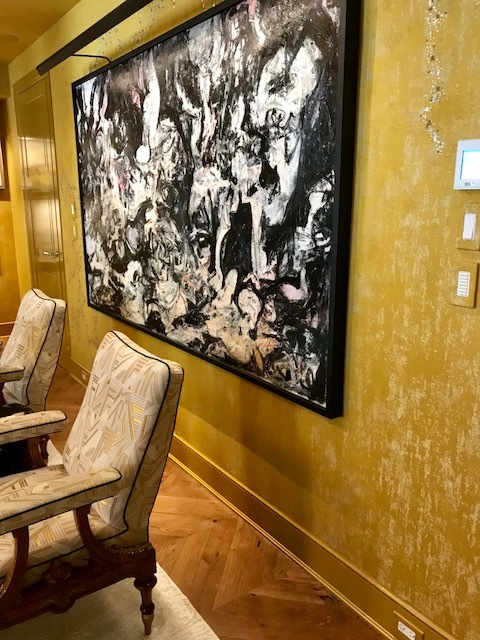 By Drake Anderson: Fabric upholstered walls with hand painted accents – big golden rod story! #2 Window treatments are getting more elaborately layered at the high end. Solo drapery panels were not the biggest tory. Rather, these were layered with interesting open weave sheers and shades….yes 3 treatments in essence on a single window. $$$$ but stunning – and yet they were often very simple and well done. I did spy – gasp – a swagged treatment and I’m praying that was a momentary blip and not sign of things to come. For the last 2 years, I’ve been seeing the Kips Bay designers getting more elaborate with their window treatments. 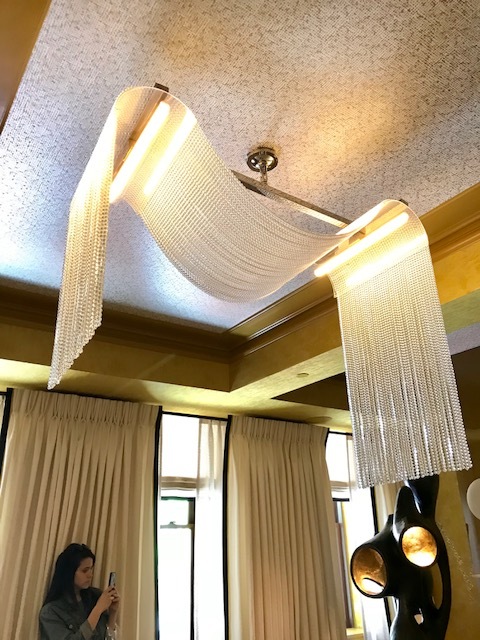 Thankfully, the whimsical (euphemism for not great looking…) pelmets of last year were nowhere to be found (Maybe they are in window treatment purgatory with the swags???). I noticed a deep balloon shade and interestingly the return of the butterfly pleat. Where IDH is on this trend: I have mixed feelings on this one. To be sure, I’m a huge believer in the power of a window treatment to truly “make a space” – certainly ours do. But we use our client’s unique design fingerprint to dictate where we take window design, along with their budget. So I’ve been watching all this stunning treatment detailing and applying it only to the right projects and clients. Designers can over design if we don’t keep ourselves in check. In the end, well detailed and strategized does not mean you have to sacrifice simple lines – which is among the reasons I’m a fan of Jamie Drake of Drake Anderson. Window treatment swag with panels and more swags in trompe l’oeil by Alexa Hampton. #3 Where did all the gray go? And what about the white walls?? Well, it’s not gone entirely, but it’s not the biggest story. Gray showed itself in whisper quiet shades in some upholstery, certainly in some rugs as well. There was a bit of charcoal by way of wallpapers, but it was not the big story by any stretch. AND, not surprisingly there was not 1 white wall in this year’s home. When gray happened on walls, it was in wallpaper. Tan undertones are coming back. Thus, we saw warm colors on the scene at Kips Bay. Not one drop of gray blue, instead a bit of rich navy and a smidge of mid-blue. Beyond that, goldenrod was prominent (a deep golden yellow) and other rich yellows, a few splashes of red, and some…peach (??? I know….I’m not on board with peach yet…the new version of millennial pink?). There was some moss green in a few doses. I readily admit to all of my clients that I’m a color trend snob. Meaning I watch with amusement sometimes. For example, I just received 2 stunning (!) emerald green velvet chairs for my own family room and I cannot tell you how glad I was to NOT see the color the show house! In my life, I love distinct. I believe in filling clients homes with colors and shades they adore. The only time I concern myself with trends is 1) when clients ask me to do trendy design for them, or 2) if I know I client is selling a property in the near term. I could care less if a design thought leader likes peach: I can name 2 dozen clients who’d rather pour bleach on their walls than paint them peach. My color trend philosophy: know the trends well, nod to them when desired and necessary, but always go for your own design fingerprint and do something distinctive…not trendy. 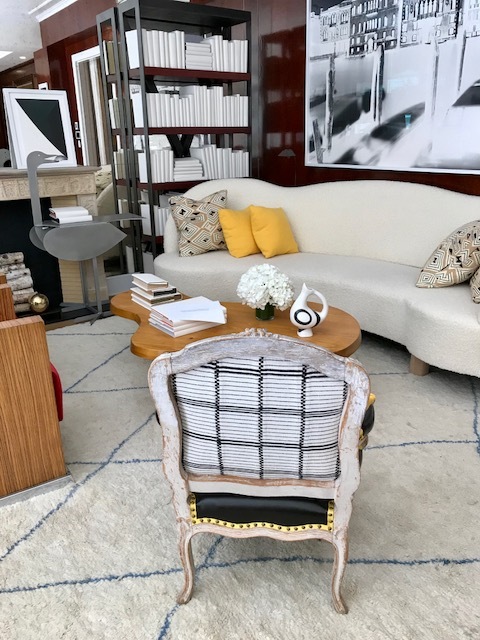 Kips Bay 2018 had an even stronger showing of antique furnishings mixed with vintage and modern than last year. 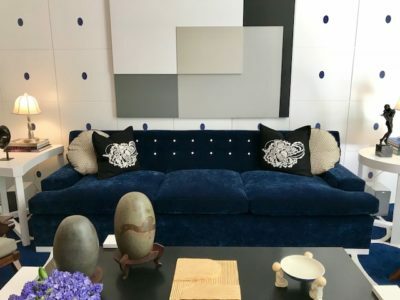 I was happy to see sleek track armed sofas as the anchor points in some rooms, but to that mix, it was a glorious “anything goes” of 18th, 19th and 20th century antiques. Also notable were iterations of kidney sofas reminiscent of the 90’s. But even these were set next to Louis XV fauteuil chairs, for example. Uphosltered headboards turned from the popular tufting to channel tufting or set amidst a Lucite® canopy. 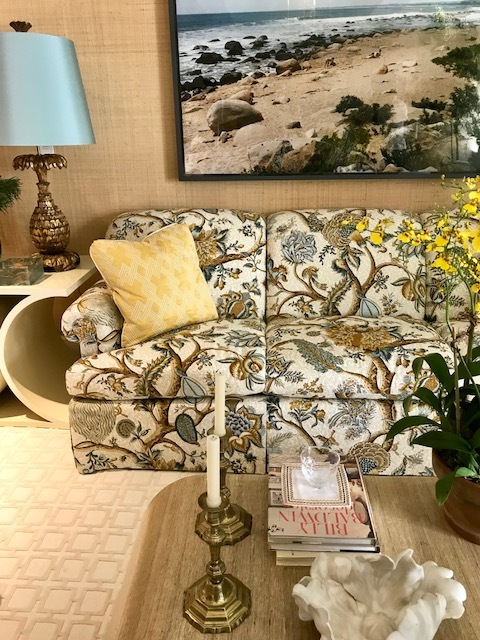 A new story was that PRINTS are back on upholstery in a big way: large scale Jacobean floral sofas sitting next to upholstered items in midscale and small scale. Contrast welting on pillows and upholstery; button tufting was not deep or overly present. But when it was done, tufting was tailored and well thought out. The newer story that sprang forward in fabric/furnishings palettes at times felt like updated English traditional. To my great pleasure, antiques mixed with every period: A Lucite® canopy bed sat alongside an antique armoire done with intricate marquetry. 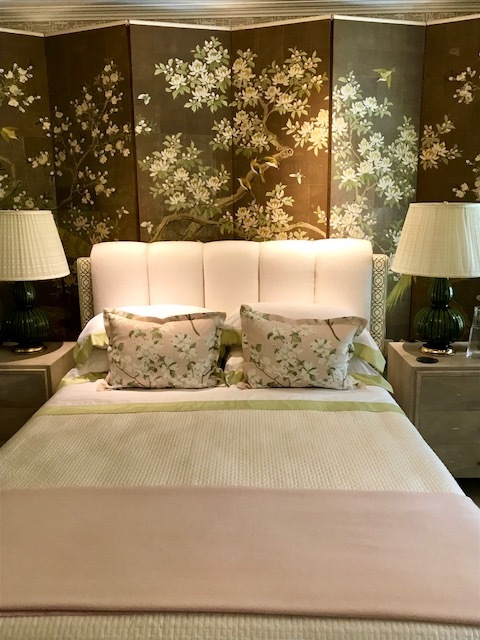 By Casa Branca – another view of her bedroom showing traditional sofa silhouette in a Jacobean floral. Well…we love it! And it never really left in good design. We love using a gorgeous family heirloom piece and bringing it to life in a new way by adding unexpected modern fresh elements around it. The look, when well done, is current, high end, and signature…and never cookie cutter. 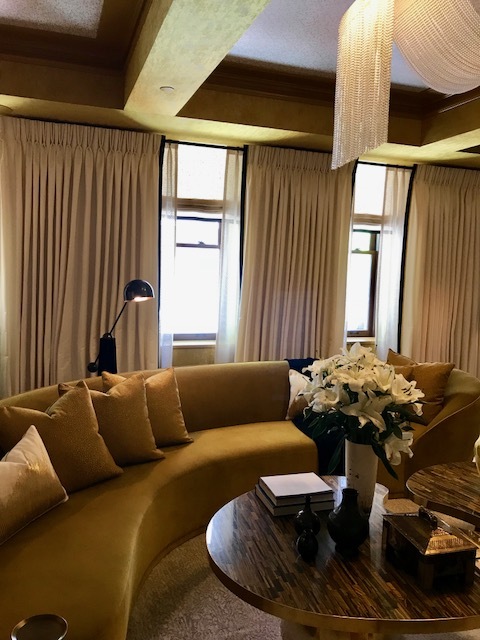 By David Netto: A kidney inspired sofa sits with a Louis chair wonderfully reupholstered with yellow contrasting trim and contrast fabric back. 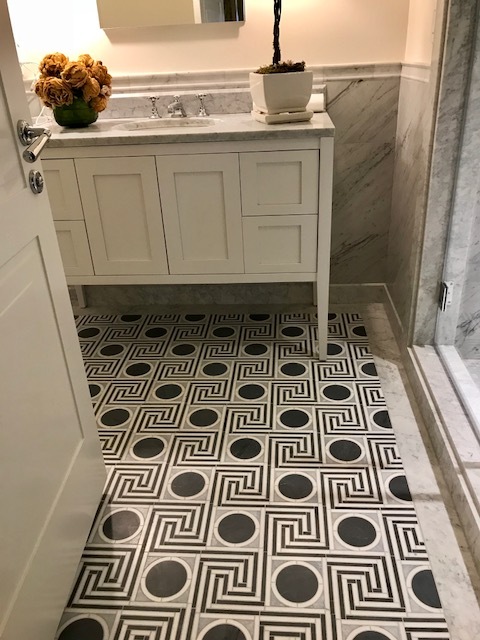 Tile is shown as clean in large cut onyx or marble slabs in bathrooms, or in wonderful geometric patterns as seen in this bath below. By Juan Montya, this room applied square wood tiles and applied wooden oval “dots”, clean checkered ceiling millwork. It’s all in the details! 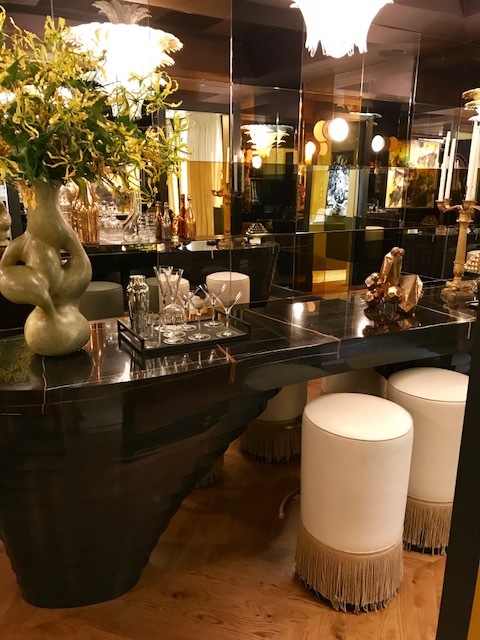 Kips Bay Show House 2018, a favorite for me this year, boasted lushly detailed spaces, perfectly crafted, and meticulously planned. There was always something wonderful for the eye to take in. While restraint was not the word of the day, I wouldn’t say that the majority of the spaces were over designed…rather…perhaps instead intensely designed. Bar by Jamie Drake: Stunning at every angle and in every richly layered detail. Another view of Montoya’s richly detailed Room: Carpet echoes a reverse of the wall pattern (see earlier image); sofa alone is richly detailed with contrast button tuft, circular pillows with contrast welt, and an embroidered medallion centered pillow. Prefect detailing, meticulous planning and layering is what our clients have always expected from us. It’s how we create the rhythms and harmonies in a space that design lovers can’t get enough of. They can’t necessarily articulate what’s at work in a space, but the effect of these elemental details we plan makes for the spectacular, “I LOVE living here” spaces we create every day for our clients. Nuance, rhythm, detailing, layering, simpatico, coherence, boldness for the right client, restraint for another…these are what separate wisely designed spaces from a page in a catalog or a lifestyle bloggers Instagram feed. Are catalogs and Instagram feeds great? You bet! But they are just very different animals from what we do here in the design trenches every day in this glorious industry we are part of. 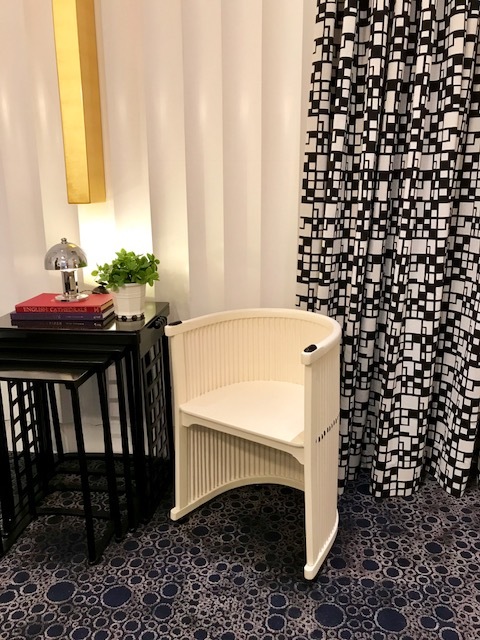 So….thank you Kips Bay 2018 and your roster of design super stars for continuing to delight entertain and above all …inspire.